රුබෙයෝලා නමින්ද හැදින්වෙන සරම්ප රෝගය මෝබිලි වෛරස් නම් ගණයට අයත් පැරාමික්සො වෛරසය මගින් ඇති කරනු ලැබේ. රෝගය ව්‍යාපත් වන්නේ ආසාදිත රෝගයකුගේ නාසයෙන් හා මුඛයෙන් පිටවන බිදිති කෙලින්ම හෝ වාතය මාර්ගයෙන් ව්‍යාප්තවීම මගිනි. රෝගය සදහා ප්‍රතිශක්තිකරණය නොමැති අය අතරින් 90% කටම අසාදිත රෝගයකු මාර්ගයෙන් රෝගය බෝවේ. ඒ නිසා සරම්ප රෝගය ඇතැයි අනුමාන කෙරෙන සෑම රෝගියකුහටම ඉහත ආකරයට වාතය මගින් බෝවීම වැලැක්වීම සදහා ආරක්ෂිත විධිවිධාන යෙදිය යුතුවේ. සරම්ප රෝගයෙහි බීජෞෂණ සමය වන්නේ රෝග ලක්ෂණ නොමැති දින 4 සිට 12 දක්වා වු කාල පරිච්ඡේදයයි. ආසාදිත රෝගීන්ට රෝග ලක්ෂණ ඇතිවු අවස්ථාවේ සිට සිරුර පුරා ලප ඇතිවී දින තුනක් සිට පහත් අතර කාලය ගතවන තෙක්ම තවෙකෙකුට රෝගය බෝ කිරීමේ හැකියාව ඇත. සරම්ප රෝග ය බුද්ධ වර්ෂ 600යෙන් ඔබ්බටද වාර්ථාවේ. කෙසේ වුවද රෝගය පිළිබදව මුල්ම විද්‍යාත්මක වාර්ථාවක් ඉදිරිපත් කරන ලද්දේ බුව . 860 –932 කාලයේදී විසු පර්සියානු ජාතික විද්‍යාඥයකු විසිනි. ඔහු විසින් රචිත ග්‍රන්ථයක වසුරිය හා සරම්ප රෝගය අතර වෙනස්කම් හා රෝගය හදුනා‍ගන්නා ආකාරය විස්තර කර තිබිණි. පසුගිය වසර 150 තුල සරම්ප රෝගය හේතුවෙන් ලොව පුරා ජනාතාව මිලියන 200ක් පමණ මියගොස් ඇත. 1954 දී ඇමරිකානු ජාතික එකලොස් හැවරිදි ඩේවිඩ් එඩ්මන්ඩ්සන් නම් රෝගී පිරිමි ළමයාගේ සිරුරෙන් ලබාගන්නා ලද වෛරසය විද්‍යාඥයන් විසින් කුකුළු කලල මාධ්‍යයක වර්ධනය කරන ලදී. මෙලෙස මේ වන විට වෛරසයේ ප්‍රභේද 21ක් හදුනාගෙන ඇත. 1963 සිට බලපත්‍ර ලද රෝගය සදහා ප්‍රතිශක්ති එන්නත් භාවිතයට ගැනේ. ජර්මන් සරම්ප යනු රුබෙල්ලා වෛරසය මගින් ඇති කරන මෙයට අදාල නොවන රෝගී තත්වයකි. ↑ Milner, Danny A. (2015) (enයෙන්). Diagnostic Pathology: Infectious Diseases E-Book. Elsevier Health Sciences. පි. 24. ISBN 9780323400374. Archived from the original on 2017-09-08. https://web.archive.org/web/20170908140851/https://books.google.com/books?id=YJ_uCQAAQBAJ&pg=PA24. ↑ Stanley, Jacqueline (2002) (enයෙන්). Essentials of Immunology & Serology. Cengage Learning. පි. 323. ISBN 076681064X. Archived from the original on 2017-09-08. https://web.archive.org/web/20170908140851/https://books.google.com/books?id=nuCT5RVToN4C&pg=PA323. ↑ 3.0 3.1 3.2 Caserta, MT, ed. (September 2013). 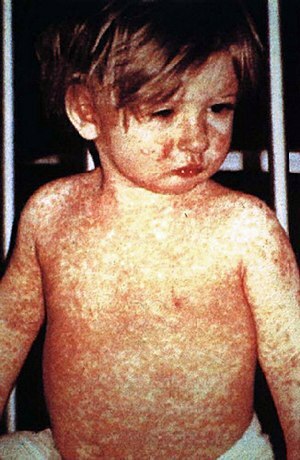 "Measles". Merck Manual Professional. Merck Sharp & Dohme Corp. Archived from the original on 23 March 2014. සම්ප්‍රවේශය 23 March 2014. ↑ "Measles (Rubeola) Signs and Symptoms". cdc.gov. November 3, 2014. Archived from the original on 2 February 2015. සම්ප්‍රවේශය 5 February 2015. ↑ "Pinkbook Measles". www.cdc.gov (in ඉංග්‍රීසි). 24 July 2015. සම්ප්‍රවේශය 25 November 2017. ↑ 6.0 6.1 6.2 6.3 "Measles Fact sheet N°286". who.int. November 2014. Archived from the original on 3 February 2015. සම්ප්‍රවේශය 4 February 2015. ↑ 7.0 7.1 Conn's Current Therapy 2015: Expert Consult – Online. Elsevier Health Sciences. 2014. පි. 153. ISBN 9780323319560. Archived from the original on 2017-09-08. https://web.archive.org/web/20170908140851/https://books.google.com/books?id=Hv8fBQAAQBAJ&pg=PT189. ↑ GBD 2015 Mortality and Causes of Death, Collaborators. (8 October 2016). "Global, regional, and national life expectancy, all-cause mortality, and cause-specific mortality for 249 causes of death, 1980–2015: a systematic analysis for the Global Burden of Disease Study 2015.". Lancet. 388 (10053): 1459–1544. PMID 27733281. doi:10.1016/S0140-6736(16)31012-1. මේ පිටුව අන්තිමට සැකසුවේ 23 පෙබරවාරි 2018 දින දී, 15:23 වේලාවෙහිදීය.